With race-day fast approaching and the taper fully kicking in, I’ve had some time to dig around into the vital statistics of the Virgin London Marathon. From completion rates through to the chances of dying on the course, this post is dedicated to the facts of marathon-running life. So, assuming you’re in the fortunate 72 percent of runners who make it to the start line (leaving more than 13,000 runners sitting at home nursing their injuries), how likely is it that you’ll make it to the finish line? You feeling lucky, punk? In 2009 just 1.42% of marathon starters didn't make it to the finish line. So, once you’re at the start line you’re statistically far more likely to complete the race than you are to drop out. 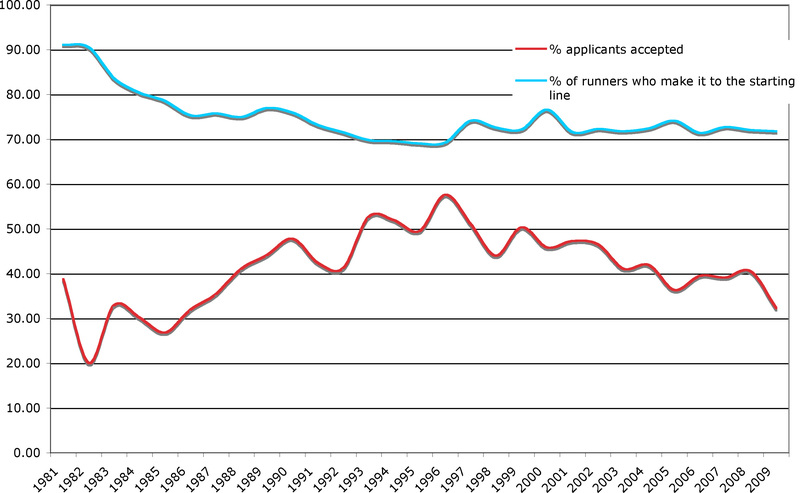 Since the turn of the millennium the trend for between 1 and 2 percent of runners to drop out has stayed pretty steady, meaning that around 500 runners a year fail to finish. During the London Marathon’s inaugural race in 1981 a rather alarming 11.34% of runners failed to go the full distance, meaning that despite a starting field of 7,747 runners 800 were left nursing ailments over the 26.2 miles. 2007 was the hottest year ever for the London Marathon, with the midday temperature reaching 22 degrees Celsius. Toasty. Around a third of the marathon runners are in their thirties. In other news up is still up and down is the other way. 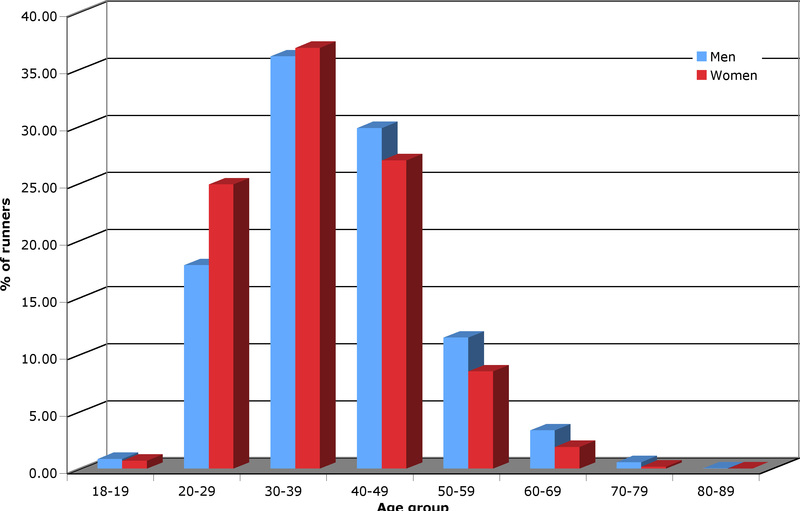 The proportion of women aged between 20 and 39 running the marathon is higher than the proportion of men running the race in the same age bracket. However, men between the ages of 40 and 49 make up nearly 30 percent of the male field, perhaps implying that running a marathon is a cheaper mid-life crisis in these post-credit crunch times. But, after all, isn’t the biggest question of the day what time the runners finish in? Based on finish times from the 2009 London Marathon, the top 2.83 percent broke the 3-hour barrier and the top 29.81 percent make it to the finish line in under four hours. 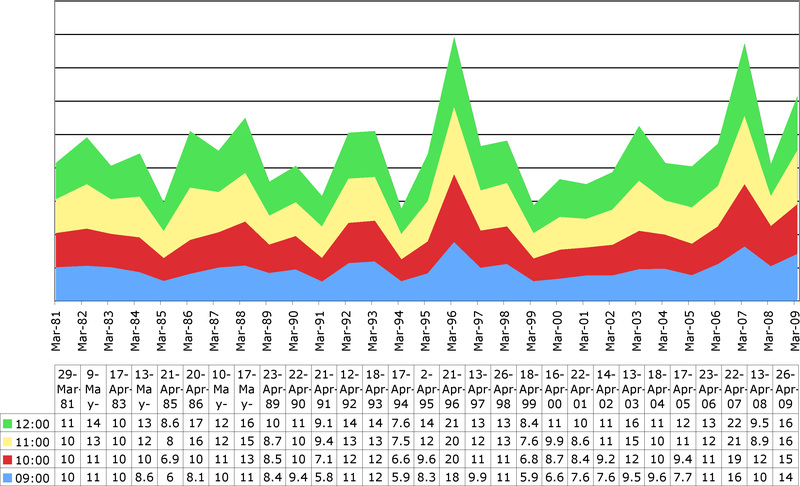 The majority of runners make up Pacman, and the sub-4 hour runners are being eaten in what can only be described as a naff reference to a very old computer game. Sorry. Running Hot | Where's the long run going?